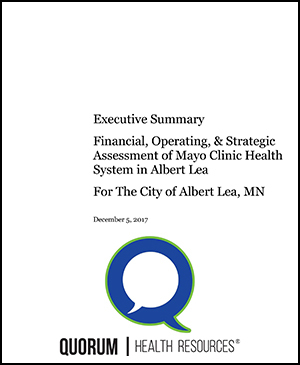 The Quorum Health Resources, LLC feasibility report regarding a full-service acute-care hospital in Albert Lea is below. The Albert Lea City Council will take public comment on the report during the December 11, 2017 City Council meeting. The meeting begins at 7 p.m. and is held in the Council Chambers at City Hall, 221 E. Clark St., Albert Lea. Quorum was contracted by the City, County and Save Our Hospital to fund this study. We support the Choose Civility and Blue Zones Projects. Click the links to learn more about the projects and upcoming events.